Julian Cope – But Is It Any Good? WHAT’S IT ALL ABOUT: Second solo album from former Teardrop Explodes front-man veers into the personal and causes some to wonder about his sanity. SOME WORDS, PHRASES AND CLAUSES ABOUT THIS RECORD: I say questioning his sanity because people saw the album was called Fried, knew Cope loved to take LSD, and posed naked with just a turtle shell – people thought he was losing it. Well, he may have not been the most stable of musicians, but Fried is a decent follow-up to his debut. Instead of gunning for the charts, he makes a more personal statement. He pares down the arrangements on several songs, using just himself and St. John (whose double-reed woodwind expertise added a great flavor to the songs). Sometimes, though, it’s a bit self-indulgent. The lyrics also make you wonder if he’s telling the truth or bending it to fit a narrative. Either way, it’s a good record for those familiar with Cope or Teardrop Explodes; not the one to start on though. “Sunspots” is a great single, though. NOTES & MINUTIAE: He wrote “Bill Drummond Says” about his former manager, who he fired. Drummond responded with a song 10 years or so later called “Julian Cope is Dead”. GRADE: B: This grade is for the self-indulgence, but it’s a solid album if you like Cope. OTHER SONGS YOU MAY KNOW: Only if you got the import or listened to 1984 college radio. WHAT’S IT ALL ABOUT: Ex-Teardrop Explodes singer and guitarist releases his solo debut in much the same mode as his former band, except a little odder lyrically. Ok, a lot odder. He did a lot of acid around this time. SOME WORDS, PHRASES AND CLAUSES ABOUT THIS RECORD: On the surface, it seems like a ‘normal’ pop record – maybe a little eccentric – maybe a little psychedelic. Definitely tuneful. The lyrics had something else to offer. Cope basically had a bit of a breakdown after Teardrop Explodes broke up (the story of their aborted sessions for their third album are, well, interesting) and became a bit eccentric and frankly a bit fried on acid. He was collecting classic toys during this period and the lyrics were also based a bit on childhood. I missed this album when it came out – the US didn’t really get a full picture of Julian Cope until later. I know this definitely would have been played on college radio if someone could get a copy of it. 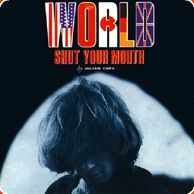 NOTES & MINUTIAE: Yes, Cope does have a song called “World Shut Your Mouth” – it’s probably his best known song in the US. It’s not on this album. IS THERE A DELUXE VERSION: Yes, some bonus cuts are afoot. GRADE: A-: I really like the tunefulness and playfulness of the music. This record epitomizes the reason I started this project – it’s an album I always heard about but never had a chance to grab – and now it’s easily available.